If you own a smart phone or a tablet the chances are that you’ve downloaded at least one app and probably quite a few more. These days there are apps for just about everything and now there’s even an app to help tourists have a more enjoyable stay in Hervey Bay. The Hervey Bay Tourist App is a free download that lists a variety of accommodation from backpacker hostels to motels, apartments and resorts, directions to cafes as well as lists of upcoming events, things to do and emergency numbers. Many of the listings in the Hervey Bay Tourist App include a scrollable map and there’s up-to-date weather forecasts for Hervey Bay too. The app is the work of Toni and Stuart Livesey from Total Website Management who believe that every business in town should be making an effort to promote the town to tourists. 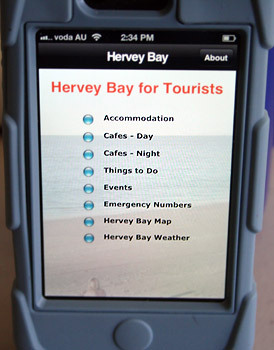 The Hervey Bay Tourist App is their contribution. The app can be downloaded HERE and will work in both Apple and Android phones.